Chula Vista Resort is our favorite year round vacation getaway destination. The resort is nestled amongst majestic pines, and scenic wooded cliffs overlooking the Wisconsin River. 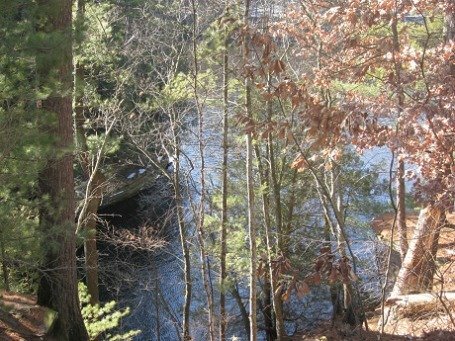 If you wish to stay in the Dells with all the desirable amenities, in a remote beautiful section of the Upper Dells, this resort has it all! The name itself, Chula Vista, meaning “beautiful views,” will capture the nature lover’s interest. So sit back and enjoy as you discover all the great features the Chula Vista Resort has to offer including top notch restaurants, 200,000 square feet of water parks, a beautiful 18 hole golf course and much more. Before I forget, take time to walk in back of the resort along their private river walk…it is breath taking! Bring your binoculars because you never know when a bald eagle will soar in the sky above. These are just some of the reasons we return year after year! Upon entering the lobby, check your wild animal guidebook and look up the different kinds of animal taxidermy displayed throughout the area. And, with a very casual but elegant southwest décor, it all blends together creating a very relaxed and inviting entrance. The Chula Vista Resort check in was efficient and the receptionists were very helpful and friendly. We booked an all-inclusive deal and what a deal it was! The price of the room included our meals, drinks, and water park entrance. We requested a room with a view, and, it is worth the upgrade. The room was spacious and equipped with a mini refrigerator, coffee maker, microwave, television, balcony and a magnificent view of the Wisconsin River! The room was decorated in a southwest theme and very clean. The Chula Vista Resort has a variety of rooms, suites, golf villas and even condos to rent…or buy! We stayed in the Tower guest room which sleeps 4-6, and was more than enough room for two. The Junior Suite sleeps 4-6 people and some are equipped with upgrades such as a fireplace or patio/balcony. The Presidential Suite sleeps 4-8 people and you can also upgrade these. The Chula Vista Resort also offers themed rooms such as Southern Plantation, Wild West, Pirates of the Caribbean, African Safari and more. And of course, you can rent or purchase a studio, loft, 1, 2, or 3-bedroom condo at the resort or a golf villa just across the road at Coldwater Canyon and receive all the amenities. There are several choices for fabulous meals at Chula Vista Resort. We ate a very good dinner at Luigi’s Pizza. The pizza’s are baked crisp in a huge brick oven….so awesome! They also offer sandwiches, wings and other fun food. Most popular is the all you can eat, Market Buffet for breakfast, lunch and dinners. We had fun watching kids load up with mac and cheese and peanut butter sandwiches from the kids buffet. They are also very kid friendly here! It seems like the buffet is half a football field in length! For breakfast we had a fantastic omelet chef who made my eggs to order with egg whites only!! One evening they had a pasta and veggie grill chef. He will put together any combination of food together you request. The Howler’s Sports Bar was a great choice for us. We could choose to sit at the bar, at tables, or on the oversized plush furniture. They specialize in appetizers and sandwiches. We ordered a Nacho appetizer and it could have fed a family! It was fun and delicious. And, the new Margaritas Mexican Grill and Cantina is a real hit in the summer with the wave pool adjacent to it! This grill is located outside, in back of the Chula condo’s and offers a wide variety of Mexican and American foods. 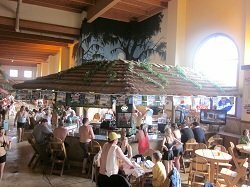 Chula also offers summer eating at the outdoor Cactus Bar and Grille, located just 120,000 feet from the water park. Paradise Bay and Desert Oasis, offer poolside eating and they have fantastic ice cream specialties. New for dining at Chula Vista Resort is the Kaminski Brothers Chop House. “It’s a restaurant designed for the sublime pleasures of hand cut dry aged beef, well chosen wines and extraordinary service”. 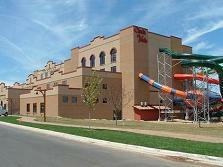 It is located on the top floor overlooking the Wisconsin River. While we have not yet eaten here, we did take a tour when no one was looking. We found it to be simply elegant. The colors and textures were warm and inviting. It was a great mix of low amber lighting, large leather booths, and the oak paneling had inlays and a mix of textures, colors and finishes. They also added a great touch of Wisconsin Dells history showing several prints of original H. H. Bennett photos from the earlier days in the Dells. The bar also overlooked the river, had leather booths, and very nicely padded bar stools. They had a complete menu and a huge selection of domestic and imported wines. The menu prices match the intentions of the ambiance, the food and service they intend to provide. The Chula Vista Resort opened a new 80,000 sq. ft. indoor Lost Rios Water park. The new park includes 13 waterslides, the world’s longest and fastest indoor zip slide, several adult and kiddies pool areas that include a lazy river, family raft rides, speed slides, a swimming pool, whirlpool and much more. We rode every waterslide they have and they were all very good rides. They have rides for every age group so you can bring the entire family. We really enjoyed the Fly’n Mayan and rode it several times. Hang on tight and keep your head and back against the rear support right from the take off. The ride starts fast, goes fast, and ends fast. It’s fast! Adjacent to the indoor water park is a huge Pesos O’Plenty Arcade. The arcade includes several game opportunities which can reward you with prizes. Food and drink are available for all at Sangria Maria‘s Tiki Bar, and Crash Landings Bar & Grill. The Chula Vista Resort has a huge underground walkway from the hotel to the water park. It is very beautifully decorated, and well lighted for a nice warm walk to the water activities during the winter months. Free passes for the water parks are included with your overnight stay at the hotel. You can also purchase day passes separately if you don’t plan to stay the night. Please inquire with the resort as sometimes the daily water park rates change. The 120,000 square foot Adventure Lagoon at Chula Vista Resort should prove to be full of fun and excitement for children of all ages. Complimentary life jackets are available for children to use. The park features 12 water slides, an outdoor pool, whirlpools, activity pools, kiddies water play areas, and a sand play area. If you are a water slide extremist, try the 60 foot high Durango Drop. For a more relaxing time, try the wave pool or the Kiddies (lazy)River….it’s fun to watch all ages enjoy the lazy river. Or if you feel like relaxing and enjoying a nice summer day, the outdoor water park has hundreds of lounge chairs waiting for you. Take a break from the water and you’ll find Superstition Springs Mini Golf a fun activity for the entire family! You will also find an outdoor mini river, activity pool, volleyball and basketball courts. The Cactus Bar and Grill and the poolside Desert Oasis are also there for snacks, sandwiches, and drinks. They also have private cabana’s for rent to get a break from the sun! Just outside from the Spa del Sol on the river side of the hotel is a large outdoor hot tub they call the “Hot Springs“. The last time we used the hot tub was on a winter night in January. It was very romantic as (mid week) we had the pool to ourselves. You can just imagine the scene with the steam rising off the water and a raging fire in the large outdoor fireplace just a few yards away. All we were missing was a beautiful nighttime snow…next trip! The outdoor hot tub is available from 9 a.m-10:00 p.m. , depending upon the time of year. You can rent robes or plan ahead and bring your own (and pool shoes), as the pavement and air can get cold after you get out in mid winter! Chula Vista Resort has over 50 years of experience in event planning. They offer numerous facilities, meeting rooms, and banquet or wedding areas. The resort added many new meeting room features including two main event areas that can serve as a main ballroom. New to Chula’s grounds is the Sport’s Complex. What a sight to see…a gigantic bubble! Call 800-388-4782 with your event needs! The Spa Del Sol, is located around the corner and is a full scale massage and rejuvenation spa. They offer massages of all kinds, nail service, pedicures, manicures, facials, kid and mothers to be menus for spa treatments! Next trip we will take in a hot stone massage. We saw several couples waiting for their “couples massage and champagne”, how fun! Just up the hall from the indoor Spa del Sol, is the Toy’s and Treats store for children or the child at heart! They have a little of everything here including stuffed animals, kids toys and clothes, water shoes, and some Chula Vista Resort clothing items, something for everyone at this shop. Directly adjacent to the Chula Vista Resort is a new joint venture with the Cold Water Canyon Golf Course. In 2006, the course took on a complete $2 million re-design that literally re-sculptured the landscape. 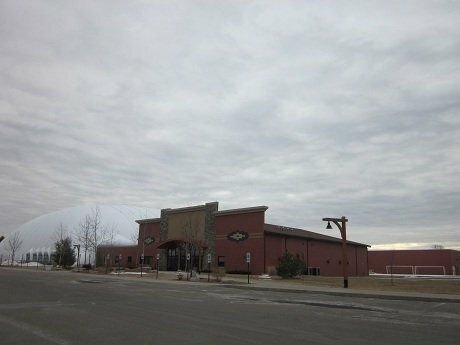 This Wisconsin Dells golf course offers 18 challenging holes, full driving range, you can walk or rent a cart, full rentals, PGA golf instruction, and re-designed clubhouse. Great packages are available for group outings. There are numerous activities planned for the entire family to enjoy such as bon fires and hayrides. At check in, ask for the weekly activities calendar so you can plan your day and night activities! Most popular amongst the children is the Cactus Kids Coral and Kids Club. You can go in there with your child and for a very modest fee you can craft some pretty cool creations! They also have a newsletter per week of activities and events just for kids. It’s pretty impressive. The exercise room, #4011 is available with a nice variety of treadmills and steppers. This room is for adults and children under 16 must have an adult present. The view from the room is unique as you look out at the Hot Springs Jacuzzi. There are also televisions available for taking in a show while you workout.